A refugee from Central African Republic checks the money she received for four people during a cash grant distribution in Mole camp, northern Democratic Republic of the Congo (DRC). The United Nations Refugee Agency (UNHCR) has expressed alarm at the recent outbreak of violence in parts of the Central African Republic’s capital Bangui, targeting civilians, humanitarian workers and UN peacekeepers. 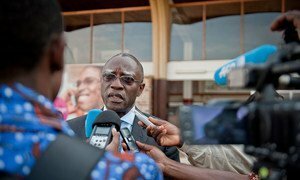 Briefing the press in Geneva this morning, UNHCR spokesperson Melissa Fleming said the latest surge in attacks in the Central African Republic (CAR) has seriously hampered humanitarian activities. Since 7 October, a series of violent incidents took place in the capital of Bangui and the UN Mission in the country (MINUSCA) has also been the target of protests and attacks. According to UNHCR, recent unrest had been reportedly sparked by a grenade attack in Gobongo in the 4th district of the capital on 7 October that killed four people. The alleged attacker, presumed Séléka rebel militia, was caught by an angry mob and is believed to have been killed. Those events had been followed by attacks on civilians that had left around nine civilians dead and 55 people injured. The latest wave of violence has displaced some 6,500 people, but that number could be much higher, UNHCR reports. In all, there are some 410,000 internally displaced persons in the CAR, including over 60,000 in 34 sites in Bangui. Around 420,000 CAR refugees had fled to the neighbouring countries. Mr. Fleming today reiterated the agency’s call on all parties involved in the conflict to respect humanitarian work and allow unhindered humanitarian access to relief agencies working to support thousands of displaced people in desperate need. Meanwhile, the UN stabilization Mission in the country, known as MINUSCA, is reporting that while some shops have reopened since the weekend and traffic has resumed, the situation in Bangui remains very tense, according to a UN spokesperson said at Headquarters today. On the political front, the Secretary-General’s Special Envoy in the country, Babacar Gaye, immediately engaged with CAR President Catherine Samba-Panza and international partners in order to contain the violence and call on the parties to return to dialogue. Today he met with the Regional Mediator in Brazzaville. The Mission, which remains on high alert, said it has stepped up its patrols across the capital and continues to work through the Bangui Task Force to address the security situation. On 11 October, MINUSCA intervened and repulsed an attack by around 100 armed anti-Balaka fighters near the residence of the Head of State of the Transition, Ms. Samba Panza, and patrols have been intensified in the area. The top United Nations official in the Central African Republic (CAR) today condemned a deadly ambush against peacekeepers serving there that left one “blue helmet” dead, one severely wounded and seven others slightly injured.